He got a group together to begin filling in the hole. The donkey was stuck. It was dark. And now, dirt was coming down on top of it a shovelful at a time. The donkey didn’t know what was happening and didn’t have a way out. It did, however, have instinct and when something landed on his back, he’d shake it off. Shovel after shovel of dirt was poured into the hole in an attempt to cover the poor donkey and put it out of its misery. And yet, with each shovel load that landed on it, the donkey would shake it off. And then, he had new ground to stand on. 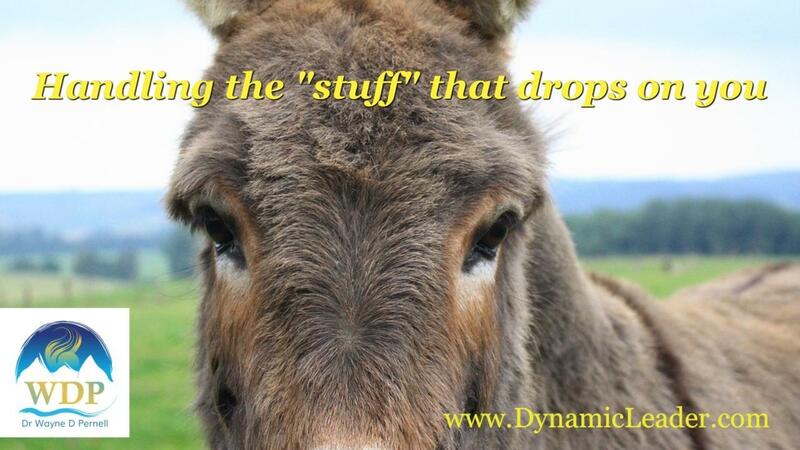 With each load of dirt that landed on the donkey, his response was to shake it off and step up. Shake it off and step up. Shake it off and step up. Shake it off and step up. The donkey wasn’t being buried after all. With each shovel load, the donkey was receiving a new platform to stand on. That which was intended to bury him as actually being used by the donkey to raise up. Relying on that process, the donkey was able to shake it off and step up all the way to a new freedom. So, when you feel overwhelmed and it’s dark, when you’re feeling alone and then stuff starts falling on you, shake it off and step up. Use what’s burying you to create a platform for yourself to step up. If you haven’t gotten Choosing Your Power yet, please go check it out. We all struggle, and yet we all deserve to step into and stand firmly in our lives. We all deserve to have a voice. You deserve to live boldly and gracefully in the world. And you deserve to shake off that stuff and step up. Check out Choosing Your Power. I’ll see you here next week. Until then, keep making your magic™.